Area artists once again rose to the FRESH ART challenge this year by using the letter Q as the secret ingredient in their art for this year’s juried exhibition, opening on Friday March 8 and continuing through Saturday, April 13. A group of 90 artists stretched their considerable imagination to include or represent Q within their artwork: literally, figuratively, covertly, disguised, camouflaged or just plain QUIRKY! Winner of the first place award of $500 is Jennifer Jones for her large mixed-media work, “Don’t Question the Queen in her Castle”. The $300 second place prize goes to Casey Vogt for “Dragons Await”, a small mixed-media work of collage, house paint & marker. 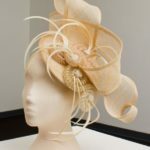 The third place award of $200 goes to Paula Singleton for her work, “Not So Vanilla Swirl”, an artist-designed headpiece. The guest judges, Robert Thurmer and Jack McWhorter, had 90 artworks to choose from and selected 43 pieces to be displayed. Jack McWhorter is Professor of Art at Kent State University at Stark. 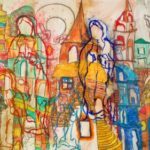 His recent shows include the WAH Center in Brooklyn, Jeffrey Leder Gallery in New York City, and the Sylvia White Gallery in California, His work has also been shown in Europe at the Sienna Art Institute, Italy and the de Bosuil Gallery in Brussels. Jack’s public artwork is a site-specific painting at Water Webs & Human Networks funded by Arts in Stark, in collaboration with KSU Stark’s Hoover Foundation for Environmental Media. Robert Thurmer is currently Director of the Galleries at Cleveland State University and is a producing artist and curator. Thurmer was educated at Syracuse University, Syracuse, New York (BFA); and The Rhode Island School of Design, Providence, Rhode Island (MFA). He has exhibited in numerous galleries, and museums both in the United States and in Europe.